Every author fantasizes about other people helping market their book. Word of mouth is still the #1 driver of all book sales. As I consult with authors, many ask me, “I can’t handle all of the marketing by myself, how do I recruit the help of others?” The best way to kick-start word of mouth is to create a Book Launch Team. 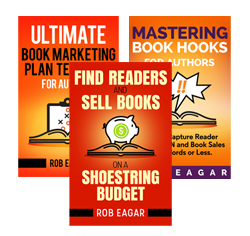 Enlist people to join your marketing efforts by letting them read your book early. For many readers, it’s a cool perk to be the first ones in the know. They get to give early feedback. More importantly, they get to tell their friends, “I’m reading a great book that isn’t yet available to the public.” Never underestimate the promotional power of fans who really like you. 1. Recruit people from your author email list and social media pages. Start the recruiting process with those who already have an affinity for you and your book. Reach out to individuals on your email list and those following you on social media. Also, ask your friends, co-workers, family members, etc. Send out 2 – 3 emails or social media posts that say, “I’d love your help…” or “Join my launch team and read my new book before anyone else.” Don’t twist people’s arms or use guilt tactics. Let people volunteer willingly. Accept everyone who wants to join. If you can get 50 – 100 recruits, you’re in decent shape. But, I’ve worked with authors who attracted 500 – 1,000 people. The more…the merrier. 2. Begin recruiting 4 – 6 weeks in advance. Timing is important. I recommend building a launch team 4 – 6 weeks before the book release date. If you ask too far ahead, people will forget, lose interest, and fail to participate. But, it’s also rude to wait until the last minute and beg people for assistance. Give people the courtesy of planning ahead for the time they’ll need to commit to reading your book and completing marketing tasks. 3. Communicate with your team via e-mail. Some authors use a private Facebook group to communicate with their launch teams. However, some of my clients report that approach can be too confusing and unwieldy. Instead, I recommend putting your launch team on a special email list. Then, use email to keep in touch with everyone throughout your book campaign. 4. Send your launch team an advance reader copy. Once you’ve recruited your team, send everyone a copy of your book to read in advance (a.k.a. – Advance Reader Copy or ARC). If you self-publish, consider an inexpensive service, such as BookFunnel.com, to send digital ARC’s to your team and monitor participation. If you’re traditionally-published, get permission from your publisher to send a full copy of your manuscript ahead of time to your launch team. Some publishers will provide a link to read your ARC on a protected website to prevent piracy. Or, they may send a PDF file with a watermark embedded for protection. It’s also okay to ask for 50 – 100 printed copies sent to key influencers or members of your launch team. The key is to get ARC’s to your team around 2 – 3 weeks before your launch date. That way, they have time to get familiar enough with your book to write a review and maintain enthusiasm. If you send ARC’s too far in advance, people can forget about it and lose momentum before your campaign starts. 5. Define the requested marketing activities upfront. Post a review of your book on Amazon and other online retailers. Preorder your book or buy a copy for a friend. Share posts about your book on their social media, blogs, and e-newsletters. Tell their friends about your pre-order bonuses and encourage early sales. As a rule of thumb, don’t expect everyone on your launch team to participate. In many cases, only 30 – 50% may take action. That’s typical response, which is why you should recruit as many people as possible. If the majority of your team completes the activities list above, you’ll get incredible word of mouth for free. 6. Reward your team for helping you. Book launch teams are an amazing part of the author experience. There’s nothing like watching dozens, if not hundreds, of people spread word of mouth on your behalf. Before you release your next book, use these six steps to build an effective book launch team. Then, sit back and watch as they create a growing wave of marketing momentum that can jumpstart your book sales. Like this free article? There’s plenty more at this page.